Le Cordon Bleu, the leading Global Network of Culinary Arts and Hospitality Management Institutes was delighted to host a cocktail party, in the premises of the new Paris Institute on 1 September, rounding off Ambassadors’ Week. During the event, Mr. Jean-Marc Ayrault, Minister of Foreign Affairs and International Development, was given a tour of the institute alongside its president, Mr. André J. Cointreau. The Minister spoke with Le Cordon Bleu students and members of the institute’s teaching team, in the presence of all the heads of diplomatic missions who were together as part of Ambassadors’ Week. This event highlights the importance M. Ayrault attaches to the ongoing strengthening of training in the tourism field. “Careers, specifically in the field of gastronomy, showcase an image of French excellence and therefore contribute to making France ever more attractive. In this respect, the Minister of Foreign Affairs and International development is nurturing a special partnership with the leading French training institutions in this domain, including Le Cordon Bleu. In this regard, he recalled the creation of the Conference of Tourism Excellence training with the ICC Paris-Ile de France and the Ministry of Education. "This conference is to strengthen the links between the main schools and universities offering training in the tourism sector". Another announcement from the Minister: the implementation of an internship program in the kitchens of the embassies of France abroad. Program in which Jean-Marc Ayrault has invited students from Le Cordon Bleu to apply for. 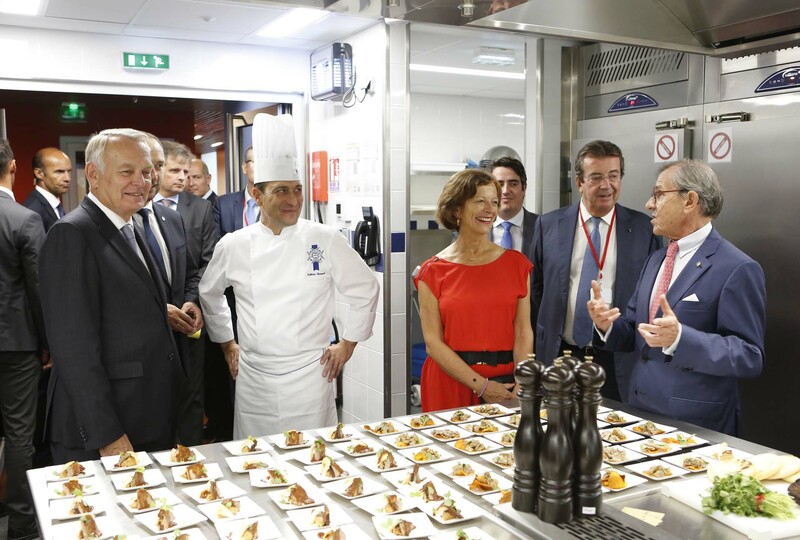 Following speeches by Mr. André Cointreau and Minister Jean-Marc Ayrault, more than 100 French ambassadors embarked on a taste journey guided by the Le Cordon Bleu Chefs, and enabling them to gradually discover the establishment. A number of culinary demonstrations were given by the institute’s alumni, including Juan Arbelaez, Fang Jin, Feiyue Bao, Reda Ben Hammida and Luis Machado. The preparation of the cocktail party was managed by Executive Chef and Culinary Arts Director Éric Briffard, One of the Best Craftsmen in France (Meilleur Ouvrier de France - MOF), with the help of his team of Chefs who were assisted by Cuisine and Pastry students. Service was carried out in part by Restaurant Management Diploma students.